Excellent for Travel due to their tiny size. They fit conveniently in a purse or pocket or occupy a very tiny part of your luggage space. 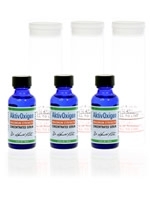 These are concentrated serums containing oxychlor compounds for the purpose of delivering oxygen to foil to the anaerobic bacteria that, when they multiply rapidly, secrete their harmful toxins and acids onto our teeth and gums. Place 8 drops in the reservoir of the Hydro Floss or add a few drops to any mouthwash to make it more powerful. You can also dilute with water to make an oxygenated mouthwash. While we do not make health claims, I can share an experience that a customer had that was related to me over the telephone. He stated that he believed the AktivOxigen drops cleared up a certain problem, when nothing else worked. He stated that his dentist was unable to solve the problem by any other means that was tried. However, please bear in mind, that we do not make health claims. Just because this worked for one person, or because one person said it worked for him, does NOT mean it will work for others. Each human body is different and reacts differently to different things. You should always be under the care and direction of a doctor when dealing with any health concerns or suspected concerns. The USFDA certainly has not studied or evaluated any statements about this or any other product on this site. Use the AktivOxigen Serum to make your primary oral rinse, or you can add some drops to any of our other Therabreath mouth rinses to make them extra strength. Toothpaste: Place a bead of TheraBreath PLUS toothpaste on your toothbrush and brush thoroughly. Be sure to brush all over - the inside of your cheeks, roof of your mouth, and back of your tongue. AO Serum: For regular use, squeeze about 8 drops of AktivOxigen Serum into the plastic measuring tube. Add water or fruit juice to fill line. Use orange or pineapple juice for best results. For a maximum strength solution, use up to 16 drops. You can also add a few drops to our oral rinse formulas for more strength. Aktiv Oxigen is a powerful tool to promote dental health. Your dental health is connected to your overall health as researchers continue to discover an ever increasing number of connections. This was the wisdom of the past too - Check a horse's mouth before you buy him. So, what are you waiting for, it is time to get started on the path to better dental health and better breath! Everyone will thank you, including yourself! Order now. AktivOxigen Serum 3 - Pack by Therabreath. Powerful oxygen compound that can make any mouthwash stronger. The drops can also be used in your Hydro Floss or any other type of oral irrigator. Aktiv Oxigen Serum Single Bottle By Therabreath. Potent oxygenated compound designed to make any mouthwash stronger or to be used in your Hydro Floss or other Oral Irrigator.